Mind sparing a few dollars for a CEO in need of a little corporate jet travel? How about spending an extra few minutes on the tarmac while the air space clears a bit? After all, the Yankees need to take off and get to their next game in Oakland on time. You may not know it, but every time buy a ticket on a commercial aircraft, part of the taxes you pay goes to subsidize the building and maintenance of airport facilities for corporate jet fliers. Further, the staggering number of private jets taking to the skies these days seems to be a big factor in air traffic congestion, which can result in delays. 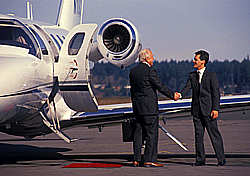 In a recent radio interview, Air Transport Association (ATA) President and CEO James May noted that every time you fly a commercial plane, about $5 to $10 of the taxes you pay goes to the FAA in the form of a “passenger facility charges.” This money funds various aviation systems, including facilities used by corporate jets. May said that although commercial aircraft uses about 74 percent of these facilities, the passengers on those flights pay about 94 percent of taxes used to maintain the system. Corporate-jet traffic pays only six percent. Corporate jets may also be contributing significantly to what May calls air “gridlock.” There are now 18,000 corporate jets in the U.S., or two corporate jets for every one commercial aircraft. As the demand for private jets grows, some have begun to call for limits on private jet flights. Over the 4th of July, the ATA asked the FAA to temporarily limit the activity of corporate jets in New York area airports to help relieve delays in the region, which often cause ripple affects around the country. No word yet on whether the FAA actually approved the idea. The airlines and other groups have been pushing Congress to overhaul the current system, including upgrades to air traffic control and a balanced taxes-and-fees structure. Advocates for the corporate jet industry have, of course, balked at the idea paying more taxes. It’s hard to predict what will actually happen, but for once I’m glad the Hill is overrun with airline lobbyists.